IN THE PAST WEEK and change we've had two major incidents involving vehicles striking buildings. One took place across Washington Park at Fourth and Hampshire. The alleged driver allegedly hit another vehicle and was allegedly being reckless when his van completely demolished the bottom floor. Allegedly he was impaired. Then he got out of jail the next morning, for some reason. He caused a ton of damage, frightened a bunch of people and displaced residents of the apartments above. Look both ways before you .... enter your building? I don't know the guy and I don't want to know the guy. I just hope he has a good lawyer and deep pockets. He's gonna need both. There's nothing alleged about that. 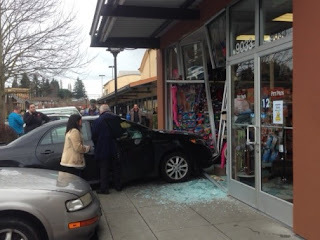 The other day two cars collided at 12th and Vermont and one smacked into a building on the corner. It happened at the same corner last summer. A few winters ago a car got hit at our busy Fifth and Maine intersection, and had it not been for a pile of ice and snow, it may have hit our building. And I can't tell you how many times I've walked across the intersection with the light and had a vehicle turning left nearly hit me. Then again, I'll thank the driver who stopped yesterday morning when my dogs got out of the store after they saw another dog across the street and got excited. That one is on me, and I'll do better. During Q-Fest, Fifth and Maine was closed, but the intersection traffic lights kept working. Sheryl wondered if a drunk driver coming up the street would see the lights but not the barricades and just keep going. GUH. You know the old saying - "If you don't like the way I drive, stay off the sidewalk or out of your building!" Funny, I guess, but all too true. Be careful out there, Q-Town.